Science is a human construction. The theories of science, to say nothing of its instruments and institutions, are the outcome of (among other things) a long series of complicated human actions. Many of my fellow historians of science believe this, as do I. But many also believe that we have only recently treated science as a human construction. I believe that this is a myth, and that Barry Barnes’ Scientific Knowledge and Sociological Theory (1974) is one source of the myth. Last year I gave some evidence for this reading of Barnes. Last week Darrin Durant questioned that evidence. In this post I give more evidence for my reading of Barnes, and hence for my claim that there is something seriously wrong with the self-image of constructivist historians of science. My claim about Barnes is that he did not properly distinguish between two charges that he levelled against earlier commentators on science, including historians. One of those charges was that of treating true theories as if they were not caused by any human activities. The second charge was that of treating true theories as if they were caused by only some kinds of human activity. I will call the former the no-cause charge and the latter the some-causes-only charge. The some-causes-only charge is plausible, but the no-cause charge is not. By conflating the two charges, Barnes made the no-cause charge seem plausible. That is, he lent plausibility to the claim that, until some time in the middle of the twentieth century, nearly everyone who thought about scientific theories had failed to see that they were the outcome of human activities. My claim about Barnes rests on passages from the first chapter of his book, passages that I quote below. These passages show that Barnes did indeed make the no-cause charge. They also show that, although he also made the some-causes-only charge, he did not clearly distinguish between these two charges. I admit that my reading of these passages ignores some salient distinctions. We might want to distinguish between the idea that a theory can be explained sociologically, and the idea that it can be explained at all; between the idea that the theory is not in need of explanation, and the idea that it does not have an explanation; between the idea that a theory has an explanation, and the idea that it was caused; between the idea that a belief has a straightforward, direct, or unproblematic explanation, or that it can be explained by its truth, and the idea that it has no explanation. These are important distinctions, but they do not compromise my claim about Barnes, for the simple reason that he did not make those distinctions, at least not in the first chapter of his book. He conflated those distinctions as thoroughly as he conflated the distinction between the no-cause charge and the some-causes-only charge. Indeed his conflations of the one may help to explain his conflations of the other. 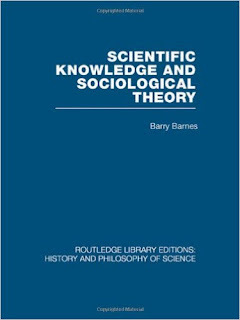 For example: if Barnes had distinguished between the claim that theories need causal explanation from sociologists, and the claim that they need causal explanation, he would not have concluded that earlier sociologists had denied the latter claim. He would have simply concluded that they denied the former claim. All of the italics in the following quotes are my own. 4. After appearing to withdraw the no-cause charge, Barnes continues to make it, sometimes in the same breath as the some-causes-only charge. In square brackets I have indicated phrases that suggest one or other of these charges, with question-marks to indicate borderline cases. [In sociology] [it] is no longer possible to treat 'truth' [no-cause], or 'naturally reasonable inductions' [some-causes-only? ], as unproblematic baselines for explanations, and all other beliefs about nature as distortions in need of causal explanation [no-cause] (11). [Sociologists of science] have tended to talk of scientific knowledge as 'consonant with experience' or 'in accord with the facts' [no-cause? ], as though this completely accounted for its acceptance within science, established its validity and excused it from causal explanation [no-cause] (12). Malheureusement je ne traduis plus tous les posts que j'écris sur ce blog. Si vous voudriez lire les posts qui ont été traduits, veuillez cliquer ici. This is a very interesting topic. I have never studied this before. Your post really gave me some food for thought. Thanks for posting your evidences. I (Michael Bycroft) am a historian of early modern science with a focus on France and England and an interest in the role of materials in the development of the physical sciences. Since October 2014 I have been a post-doctoral researcher at the History Department at the University of Warwick, UK. Click here for my CV, and here for an introduction to this blog. My papers can be downloaded from this page.